You are here: Home / Gettin’ my magma jollies! I’ve been following Rei, a blogger from Iceland, who is reporting on the Bárðarbunga/Holuhraun volcano as it continues to erupt. It’s way more impressive/scary than I originally thought. It’s huge, with fresh lava covering 37 square km, or about 2/3 the size of Manhattan, and the magma fountains are shooting 300 feet or more in the air. Her recent posts have shown a lot of information about the volcano’s progress. The one from last Saturday contains the best view so far of the extent of the lava, and absolutely stunning views of the magma sloshing around. The video is second-to-last picture on this page. For a bit more context, you can read her earlier posts. This map shown on this link tells more of the story. 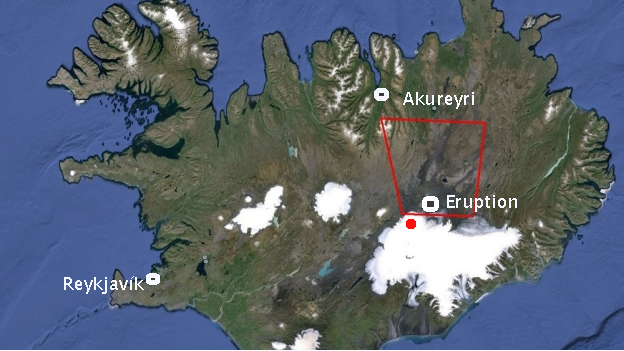 The big volcano, called Bárðarbunga, is at the red dot in the big glacier. The magma has pushed about 70 km (45 miles!) beneath the surface to erupt at Holuhraun, labeled with “Eruption” below. The good news is that the magma remained underground until it got to a flat sandy desolate location, instead of coming up under the ice and melting it (to make flood) or an ash volcano. The other good news is that the (poisonous) sulfur dioxide has mostly been blowing northeast, so it hasn’t seriously affected either Reykjavík or Akureyri.